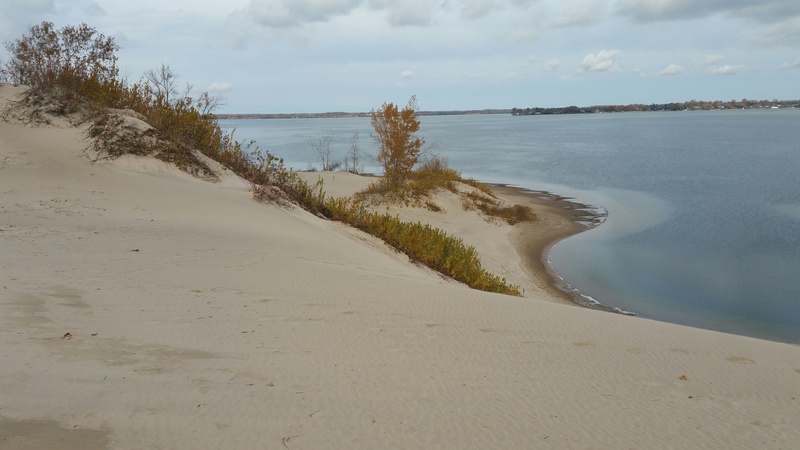 After a busy 3 week period in which I was in Ottawa twice for teaching and in which we completed all of the interior painting (except for a few areas that need to wait), we took most of today off and visited the sand dunes of Sandbanks Provincial Park. It was a good break! The sand dunes are an amazing sight, regardless of the time of year. They are said to be the largest baymouth barrier dune formation in the world. They rise as high as 60 metres (200 feet) from the lake and stretch 8 kilometres along the shore of Lake Ontario, in the western part of Prince Edward County (about 20 minutes from our place). If you are interesting in seeing an interesting video about the formation of the dunes, you can go to this website. Here are a few of our favourite scenes from the afternoon. Taken from near the top of the highest dune in the park. West Lake is below. 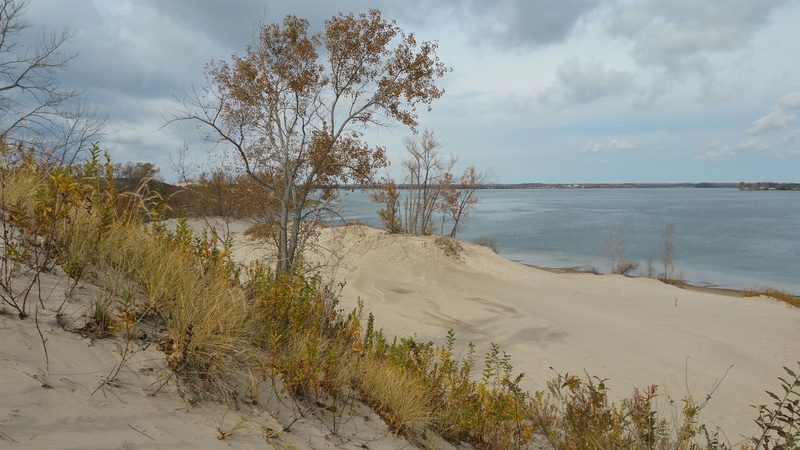 It used to be a bay of Lake Ontario but the sand dunes have cut it off from the larger lake and it is now a separate lake. It is amazing how many plants are able to grow in the almost pure sand. Some of the trees (willows) were planted about a hundred years ago to try and stop the damage to the dunes caused by human activity such as cutting trees and cattle grazing. When the vegetation was removed, the dunes began moving inland and covering farms and buildings. 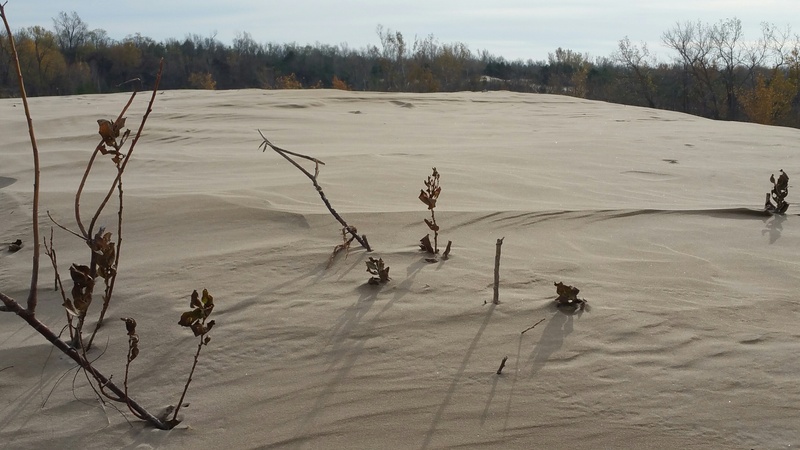 Although the dunes are now more stable, the sand is constantly shifting. 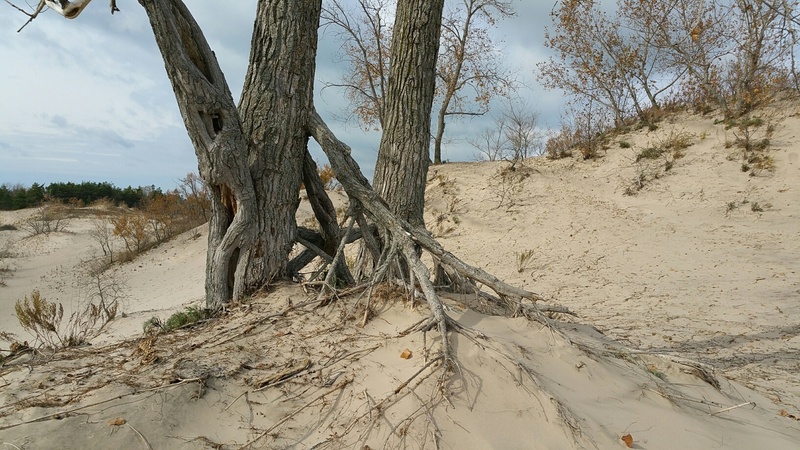 You can see from this photo how the tree’s roots have been exposed by the wind moving the sand away. And not far away the sand is covering things up. 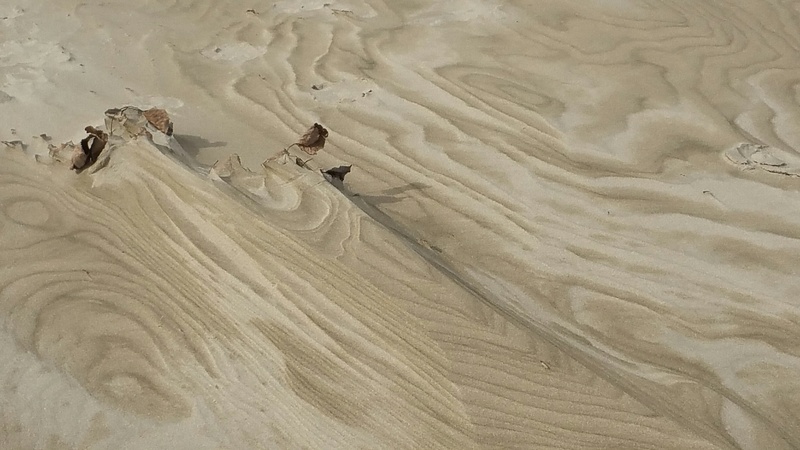 After several days of wind and rain this week (thanks to a strong storm associated with the remnants of Hurricane Patricia), some of the sand has been blown into beautiful and intricate patterns on the surface of the dunes. No, he doesn’t belong to a cult that worships trees on the tops of the dunes. 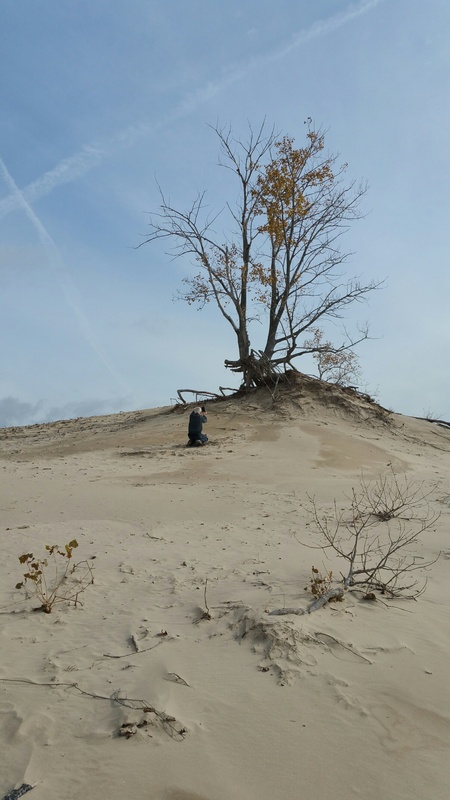 He is just trying to get a good shot of the tree roots being exposed by shifting sand.